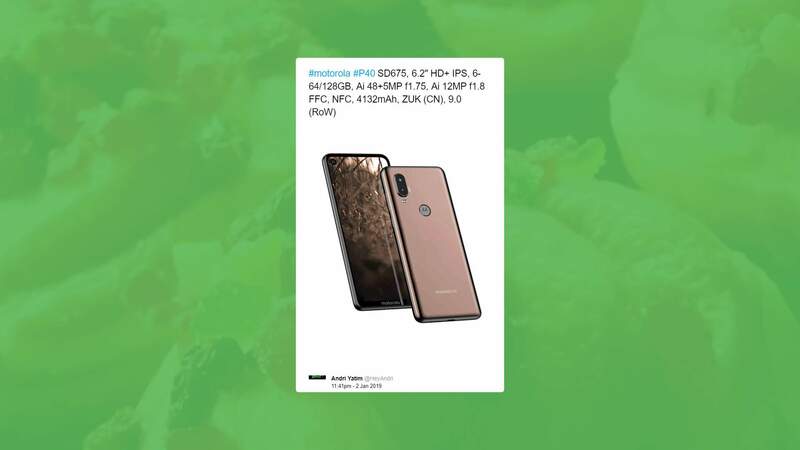 A week back in December last year, we got our very first look at the successor of Motorola P30, which will be most probably called the Motorola P40. The phone is going to feature an in-display front camera and a huge 48MP sensor on the rear. So, this is going to be a different phone from Motorola. Today, a source revealed some of the major specifications of the P40, and it looks like Motorola is all set to launch a solid mid-ranger in the form of P40. We already know how the phone looks, thanks to the CAD renders by OnLeaks. Talking about the specifications, the processor that powers the Motorola P40 is the Qualcomm Snapdragon 675. The Snapdragon 675 launched last year in November and is a successor to the Snapdragon 670. We are yet to see any phone with this processor, and we cannot say if Motorola will be the first or not. The Snapdragon 675 is an 11nm processor with Kryo 460 cores clocked at up to 2.0GHz & has the Adreno 612 GPU. It is weird that the Snapdragon 670 is a 10nm processor whereas the Snapdragon 675 is an 11nm processor. It looks like Qualcomm made some mistake while deciding the names of these chipsets. Anyways, it is a powerful mid-range chip that we will see in a lot of phones this year. The source revealed that the Motorola P40 has a 6.2-inch IPS display with HD+ resolution. Now, we don’t think Motorola will put a 720p display on a high-end mid-range phone. So, it could be a typo. We are expecting at least a Full-HD+ display. There is 6GB RAM and 64/128GB internal storage. There is a single 12MP f/1.8 front camera, and that’s placed in a small circular cutout in the display on the top left. On the rear, the P40 has a primary 48MP sensor with f/1.75 aperture and a secondary 5MP sensor, probably for depth sensing. Finally, there is a 4,132mAh battery underneath, and it is an Android One branded phone running Android Pie out of the box. In China, the phone will launch with ZUK UI on top. Well, we cannot say if these specifications are 100% correct so consider them with a pinch of salt. Do let us know what do you think of Motorola P40’s design and the specs.